Introduction Fibrin monomer (FM) concentrations reflect pro-thrombin activity and have the potential to predict thrombotic events relatively earlier than other haemostatic markers. 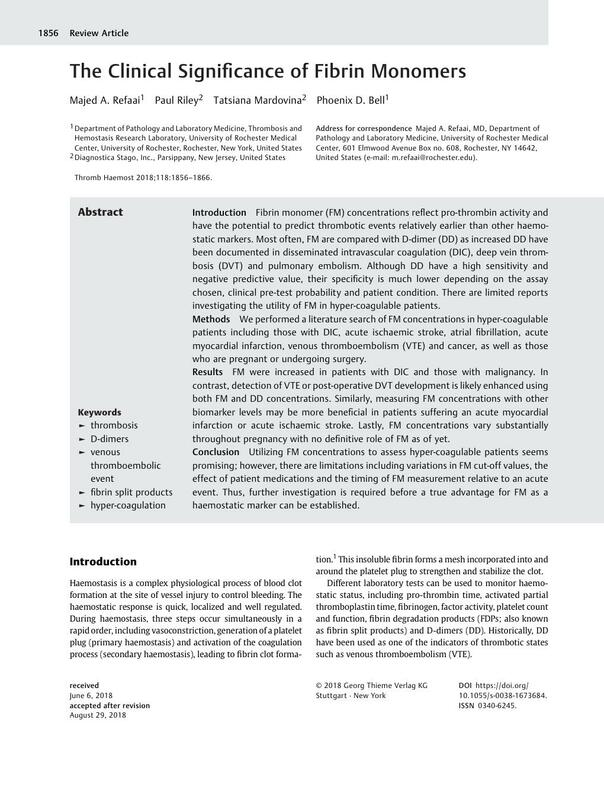 Most often, FM are compared with D-dimer (DD) as increased DD have been documented in disseminated intravascular coagulation (DIC), deep vein thrombosis (DVT) and pulmonary embolism. Although DD have a high sensitivity and negative predictive value, their specificity is much lower depending on the assay chosen, clinical pre-test probability and patient condition. There are limited reports investigating the utility of FM in hyper-coagulable patients. Methods We performed a literature search of FM concentrations in hyper-coagulable patients including those with DIC, acute ischaemic stroke, atrial fibrillation, acute myocardial infarction, venous thromboembolism (VTE) and cancer, as well as those who are pregnant or undergoing surgery. Results FM were increased in patients with DIC and those with malignancy. In contrast, detection of VTE or post-operative DVT development is likely enhanced using both FM and DD concentrations. Similarly, measuring FM concentrations with other biomarker levels may be more beneficial in patients suffering an acute myocardial infarction or acute ischaemic stroke. Lastly, FM concentrations vary substantially throughout pregnancy with no definitive role of FM as of yet. Conclusion Utilizing FM concentrations to assess hyper-coagulable patients seems promising; however, there are limitations including variations in FM cut-off values, the effect of patient medications and the timing of FM measurement relative to an acute event. Thus, further investigation is required before a true advantage for FM as a haemostatic marker can be established. M.A.R. : Developing the concept of the review, editing drafts of the manuscript and revising for proper clinical content. P.R. : Revising and editing final drafts of the manuscript. T.M. : Revising and editing final drafts of the manuscript. P.D.B. : Performing the literature review, writing and editing drafts of the manuscript.